Hello my lovely friends, ...... Happy Valentine's Day ! Today I want to share with you my Valentine's card. I have colored them with Copics and put some love random text for background. 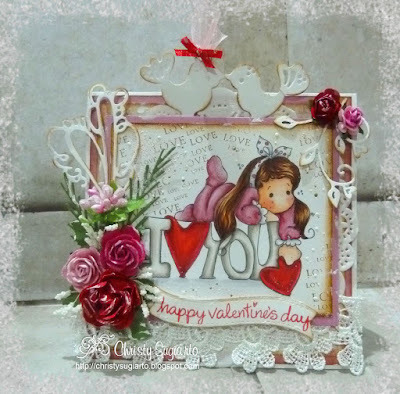 Some embossing powder Frantage vintage pink around her too. I decorated my card with flowers, doily paper, lace, ribbon and some die cut. I stamped on banner die cut from MFT dies. That's all for me today and thank you for stopping by. Hope you have a great time with your lovely one. Hi Kristy, this is such a beautiful card! I love the design, image and your beautiful colouring! Thank you for sharing with us at the Marvelous Magnolia, good luck and I hope you will join us again. Your card would also match our current challenge with the Sweet Stampers. Check it out. Gorgeous card! I adore the image you chose & your coloring is fantastic!! Great design and your use of dies & embellishments just finishes it off to perfection. Thanks for joining our weekly QKR Stampede challenge! Oh my goodness Christy this is gorgeous...your beautiful image set amid all the love is fabulous!! Thank you for sharing with us at Lovely hAnglar or Sweet Magnolia...good luck! Beautiful card Christy! Gorgeous coloring on this sweet girl! 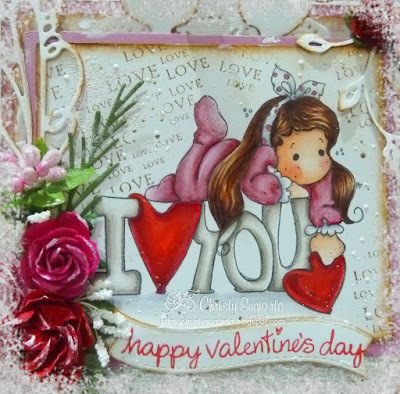 I love all the fabulous dies and embellishments, too! Thanks for joining our weekly challenge at QKR Stampede! Beautiful card! 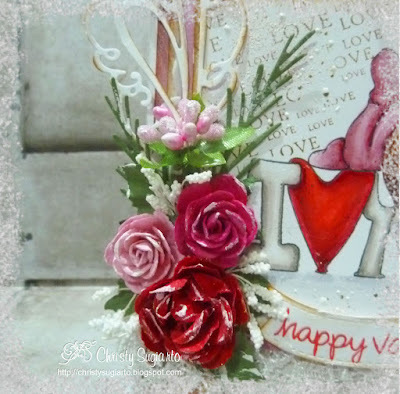 Love the image and die cuts you used. Great job with the embellishments! Thanks for sharing with us at Die Cuttin' Divas! Thanks for joining Die Cuttin Divas this week! Stunning card. Thank you for joining us at Simply Magnolia challenge. Good luck.